At MyMarrakech.ch you can rent a privately owned vacation rental or holiday rental in the Medina of Marrakesh. With us, you always book the entire vacation rental. There will be no other guests, just your family and friends! All vacation rentals are owned by Swiss individuals. Moroccan artists have uniquely combined material, arts and colors to enable a unique experience for your holiday rental in Marrakesh. Contact us! Vacation rental Riad Petit Palais Marrakesh: Recently renovated Sahara-style boutique Riad in the Medina of Marrakesh. Vacation rental Riad Naila Marrakesh: Rated best private holiday rental in the Medina of Marrakesh on Flipkey/Tripadvisor. Vacation rental Riad Moulaty Marrakesh: Spectacular view on one of the most beautiful gardens in the Medina of Marrakesh. Vacation rental Riad LakLak Marrakesh: Constructed in the 17th century with Moorish/Jewish architectural style. These are 360 degree photos of Riad LakLak Marrakesh. Use your mouse to move them. All our Riads have a fully equipped kitchen that you can use for your cooking. Nevertheless, we advice you to try Fatima’s kitchen. 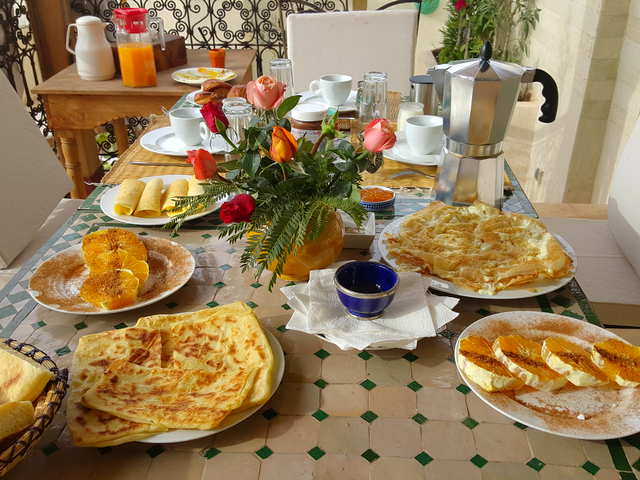 Breakfast includes fresh orange juice, Moroccan crepes, fruits, omelets, bread, butter, jam, tea and coffee and costs 5€ per person. It is served on the roof terrace or in the patio. A Moroccan dinner includes various Moroccan salads as a starter, a Tajine as the main dish, and a Moroccan dessert. The Tajine is made with beef, chicken, lam or vegetables only. For a 3-course dinner, we ask for 20€ per person. Ask for a discount for large groups. Children up to 8 years eat for free. The minimum charge for hot dishes (tajine and couscous) is € 40.00. Fatima cannot prepare several meat dishes at the same time. Please order the same meat for everyone. We can always add a vegetarian version to it. Please allow sufficient time for preparation. Non-alcoholic beverages are included. Bring your own wine or beer! You can eat very well in the Medina of Marrakech and sometimes even cheaper. Our prices reflect the fact that Fatima just cooks for you. We do not serve meals in Riad Petit Palais, they are served in Riad Almoulouk which is very close by. Enjoy our breakfast and dinners on the roof terrace of your holiday rental! Our holiday rentals are located in the old town of Marrakesh and there is no direct access by car. We can pick you up at the airport, the train station, or the bus station. A transfer costs 15€ for or up to 7 persons. Ask for the price if you are more than 7 persons. We know many good drivers for your day trip to the Atlas mountain or Essaouira. Currently, the daily rental price for a car with driver is 130€. The car can fit up to 7 persons. Please ask us for a quote. A trip to the Sahara requires at least two days. Ask for a quote. A guide who can help you discover the many cultural and historical aspects of Marrakech costs 50€ for a half-day tour. Our holiday rentals are close to many of the best restaurants of Marrakech. Here are some suggestions for restaurants in the medina of Marrakech. Alternatively, you can enjoy excellent local cuisine at the food stands at the "place des ferblantiers" or the famous "Jemaa el Fna" square or ask Fatima to cook for you and serve it on the roof terrace of your private holiday rental in Marrakech. Many of the most famous attractions of Marrakech such as the Bahia Palace (Le palais de la Bahia) and the Sâadian tombs (les tombeaux sâadiens) are just a few steps away from our holiday rentals. Here are the most popular attractions in the Medina of Marrakech. There are many options to relax at a pool in Marrakech. Here are our suggestions for relaxing at a pool in Marrakech. Here you find today's weather in Marrakech and a temperature table for the whole year.